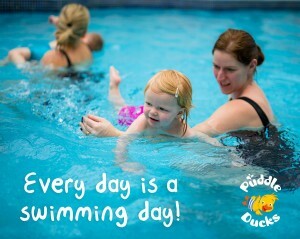 Puddle Ducks are one of the UK’s leading providers of swimming lessons to babies, toddlers and pre-school children. Our classes are designed to promote bonding, water confidence and water safety in a fun and loving environment. We take your little ones through a structured programme designed to develop their natural affinity with the water and encourage them to learn to swim independently. And although we have spent many years carefully developing our progressive lesson plans to develop swimmers, our teachers adapt every activity to suit each child. Our approach ensures that your child’s needs are expertly fulfilled – never forcing development, but rather nurturing it to ensure a positive experience and love of swimming. We also run Aquanatal classes, so you can start your journey with Puddle Ducks before your baby arrives!